white film, enlarge prints from the negatives and have a basic understanding of SLR cameras, filters and print presentation. Students should be in the process of developing a photographer’s eye by exploring the history of photography through photographers who have made a difference. Students will also explore their own style through a variety of photographic assignments. Recognize the importance of personal experience and express it in visual terms. Explore a variety of content issues including current cultural and world events, school, community and personal issues that are meaningful to the student. Research and recognize prominent photographers, their artworks, movements and styles from various times and cultures. Consider how photography has influenced the world and is influenced by society today. Consider what role photographers have played in our culture. Develop critical thinking skills that enable one to describe, analyze, interpret and judge photographic works in writing as well as orally. Develop an artist statement about their work. Visit several galleries and conduct a formal gallery review of artworks. Present and discuss work in a portfolio review. Keep all photographs and written work, lesson plans and graded rubrics organized and accessible in a binder. No eating, drinking or chewing gum in class. No CD players, iPods, cell phones or other electronic distractions during class time. Cell phones must be turned off during class time. You may not leave classroom without a pass. No writing on desks or in books. This is “Destruction of School Property” and is a serious offense. Certain equipment requires prior permission before use. When in doubt-ask. Return all equipment (including developing tank and components) to their proper place clean (and dry if possible). Pick up all trash around and in desk. Wash desktops with spray and sponge at the end of each class. Stack seats at the end of each class. Knock before entering Darkroom Door . No more than 3 people at a time through door. Pass through doorway without any stops. Do not stop rotation of door from classroom or darkroom. Do not lean on door walls. Sign up for an enlarger at the beginning of the period. Use only the enlarger to which you have been assigned. No visiting in the darkroom. Anyone entering darkroom must get prior permission to do so from teacher. Always use the proper tray when transporting a wet print or test strip. Fixer stains, so dress accordingly. Do not play with Eye Wash.
Make every effort to retrieve all test strips and prints before the end of class. Empty drawers of all unused test strips. Clean up trash both around the enlarger and on floor. This is a great classroom/darkroom and we want it to stay as clean and efficient as it is for many years. Please do your part! Please mark your calendar for these important dates: Wednesday August 24: AQDA forms & Lab Contributions are due. October 4, 6:30 pm: “ArtQuest 25TH Annual Fall Showcase of Programs”, beginning at 6:30 pm in the Auditorium. This is an evening for prospective students and families, to find out more about the opportunities ArtQuest has to offer, as well as current ArtQuest families to learn more about the program. Please plan to attend and also help us spread the word. Early application is highly recommended due to limited space. Syllabus Overview - Expectations, Requirements, Objectives, Best Practices. Welcome dear photo-adventurer. you are just about to discover the most interactiv, vivid, blurred and crazy face of photography worldwide. we heartily and most warmly invite you to dive into our unique online photo-features, to taste our cameras and -most of all- to become a lomographer. help us to simply build the biggest snapshot portrait of our planet and to revolutionize the picture communication from the hip. prost. Development - 1st Rolls - 10 pnts - Due end of 1st Qtr. Consider an assortment of objects that you would like to construct 3 compositions with ... translucent and reflective objects make for interesting shadow and outlines, light streaks etc...Finals mounted and sleeved. Working with a partner create a pinhole self portrait negative and produce a contact print final. Mount and sleeve final positive. Photography and Short Course Mounting Descriptions and process. Photo from Photo History - (Phaidon Photo Book) -Worksheet/ Paper/ Presentation - 3 pnts. ea. SRHS - Home / Begin Elements and Principles - 1st Roll - 10 pnts - Due end of 1st Qtr. 1st Print - Illustrates Elements and Principles - 5 pnts. Includes Artists Statement and Print Evaluation form. Research Project - Photographers Profile - 50 pnts. Images in sequence which illustrate the side effects of shutter speed / time value selections. 1st Print - Illustrates Elements and Principles - 25 pnts. Action Print - Illustrates Elements and Principles - 25 pnts. DOF Print - Illustrates Depth of Field - 25 pnts. Utilizing the self timer, cable release or directing a surrogate create a series of self portraits for the spring. What is the context of the image of your self what does it reveal about you or this time in your life? Personal Works - Students continue to develop your printing skills working through personal images made on rolls 1-4. Utilizing the self timer, cable release and tripod create a self portrait revision for the spring. What is the context for the image of your self? what does it reveal about you or this time in your life? Final Portfolio - We will create portfolios for mounted images for transport - Please retain and maintain for return in the Fall. Final Binder- Compile all negatives, contacts, condition reports and print evalutions. Digital Camera - a digital camera is required for Intermediate Photo. Begin process to get your hands on one. If you have one - summer reading is your camera manual. Home Computer System w/ Graphics Software - a home computer system with graphics editing software although not required is highly recommended. If you have one spend the summer orienting yourself to use of the system and the software. Make a few collages with existing digital images or downloads. A Story of Summer - document an event or an adventure specific to your experience of the summer. Pushing Film allows you to shoot in lower light situations. order to compensate for the underexposure. 400 ASA pushed to 800 ASA - 50% overdevelopment - 10 minutes normal development time = 15 minutes. 400 ASA pushed to 1600 ASA - 100% overdevelopment - 10 minutes normal development time = 20 minutes. Select an object- must be larger than 1/2 your body size, no larger than you are able to carry.. Choose a location for placement of said object and photograph. Includes developing a written thesis of the object and how you have photographed and presented it. Alternative methods in the final presentation are incouraged with review and approval by instructor. Make a minimum of 36 exposures of the object of art from a variety of vantage points, angles /lighting situations or conditions, utilizing various lenses if required or desired. 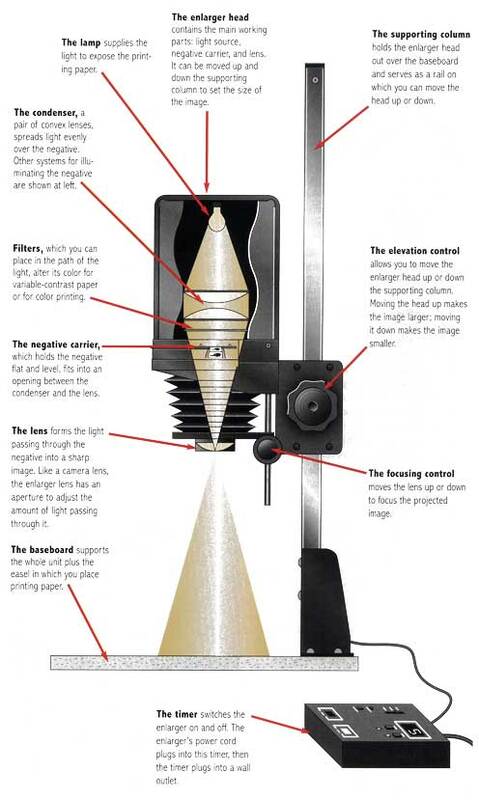 Utilize any tool at your disposal in both the shooting, development, printing, or presentation processess.